Operating on all 3G and 4G frequencies in Australia and abroad, this high grade antenna can be used in a range of residential, commercial, and industrial mobile broadband applications on any mobile network. This is the ideal external antenna for Cel-Fi repeater systems. The Blackhawk Wideband LPDA Antenna provides an ideal solution for 3G / 4G voice and data applications. 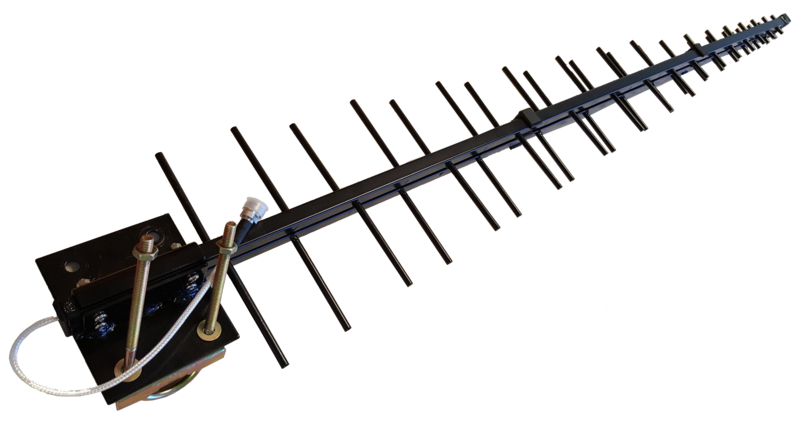 With the rollout of new 3G and 4G frequencies such as 700 MHz 4GX and 2600 MHz 4G, traditional Yagi antennas just haven't been able to keep up. LPDA antennas allow a single antenna to cover all frequencies with the high gain of a Yagi antenna that rural and remote areas demand. This one antenna can be used on any mobile phone network in Australia, in any area without worrying about compatibility. Mounting is made simple with a mast down-tilt bracket and U-Bolts. This enables you to mount the antenna on a flat surface or a pole making it suitable for a wide variety of applications. A Log Periodic Dipole Antenna, or LPDA for short, is a clever antenna design that provides exceptionally wideband performance by phasing a series of elements together, much like an ordinary yagi but with each successive element of a smaller (or larger) length. The result of this clever engineering is an antenna that holds high gain, with good tuning, across the entire cellular frequency range. Blackhawk Antennas are a quality antenna supplier based in Australia. Primarily supplying equipment to improve cellular mobile network performance, Blackhawk equipment represents a best-in-class solution which carefully balances economics with RF performance.